Synthetic Fluorphlogopite, Mica, Cetearyl Ethylhexanoate, Hdi/trimethylol Hexyllactone Crosspolymer, Dicalcium Phosphate, Glycerin, Squalane, Parfum (Fragrance), Octyldodecyl Stearoyl Stearate, Caprylyl Glycol, Ethylhexylglycerin, Polysorbate 80, 1,2-hexanediol, Benzyl Salicylate, Dimethicone, Chondrus Crispus Extract, Xanthan Gum, Pentaerythrityl Tetra-di-t-butyl Hydroxyhydrocinnamate, Zinc Stearate, Silica, Lauroyl Lysine, Amyl Cinnamal, Cetearyl Alcohol, Limonene, Coumarin, Hexyl Cinnamal, Linalool, Geraniol, Citronellol, Bht, Citral, Acrylates/octylacrylamide Copolymer, Isostearyl Alcohol, Stearic Acid, Tocopherol, Aqua (Water). [+/-:ci 15850 (Red 6, Red 7, Red 7 Lake), Ci 15985 (Yellow 6, Yellow 6 Lake), Ci 19140 (Yellow 5, Yellow 5 Lake), Ci 42090 (Blue 1 Lake), Ci 45410 (Red 27, Red 27 Lake, Red 28 Lake), Ci 73360 (Red 30, Red 30 Lake), Ci 77007 (Ultramarines), Ci 77163 (Bismuth Oxychloride), Ci 77288 (Chromium Oxide Greens), Ci 77289 (Chromium Hydroxide Green), Ci 77491, Ci 77492, Ci 77499 (Iron Oxides), Ci 77510 (Ferric Ferrocyanide, Ferric Ammonium Ferrocyanide), Ci 77742 (Manganese Violet), Ci 77891 (Titanium Dioxide)]. 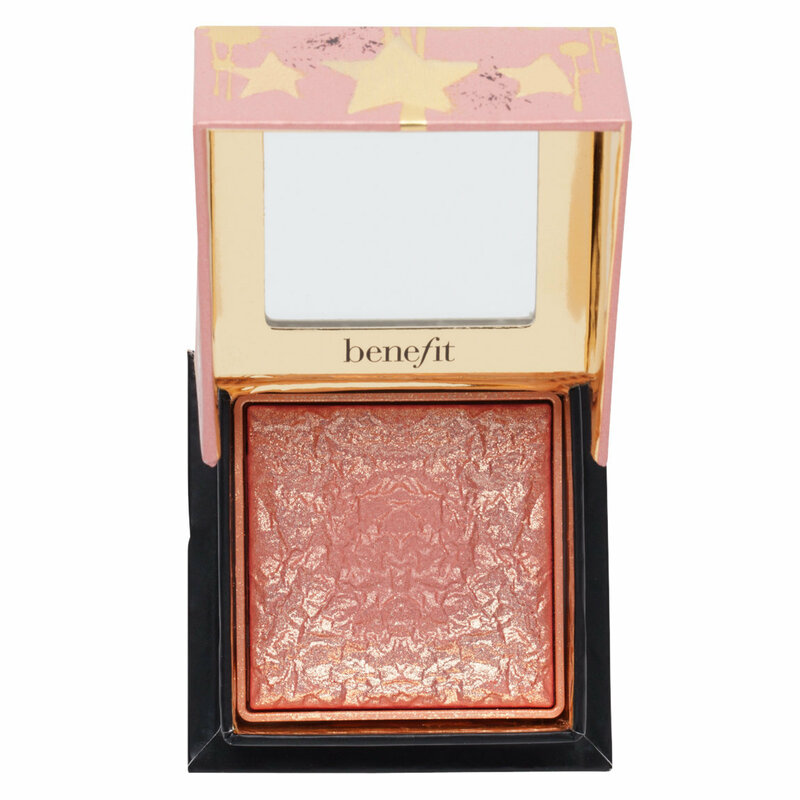 Benefit's Gold Rush blush has a golden nugget design overspray that gradually lifts away to reveal a rich golden-nectar shade infused with delicate, golden flecks. Sweep on this golden-nectar blush for a rush of gilt-y pleasure! The universally flattering peach color is buildable, blendable & adds a touch of luxe to every look! Features a signature golden amber scent with notes of citrus, vanilla & sandalwood. Powder blush with a soft, subtle sheen. Rich golden-nectar shade flatters all skin tones. Includes rounded brush & built-in mirror. Sweep onto the apples of your cheeks & blend upward using the custom rounded brush. Bought this for my picky sister. Again, and she is very neutral and light about her make up. She does not like caked face make up, she calls it MAC style make up. She said it is very bad and unnatural for the skin. Anyways, she absolutely loved this product because it gave her a soft glow and still made her feel natural. Lasted her a while and did not feel that it was excess powder on her.